Many agents and editors can tell you to start a blog, get a Twitter feed following, and to think about how to publicize yourself in case you don’t get much help from your publishing house. All of this on top of writing a novel, yes. At P.S. Literary we don’t just talk the talk, we walk the walk. 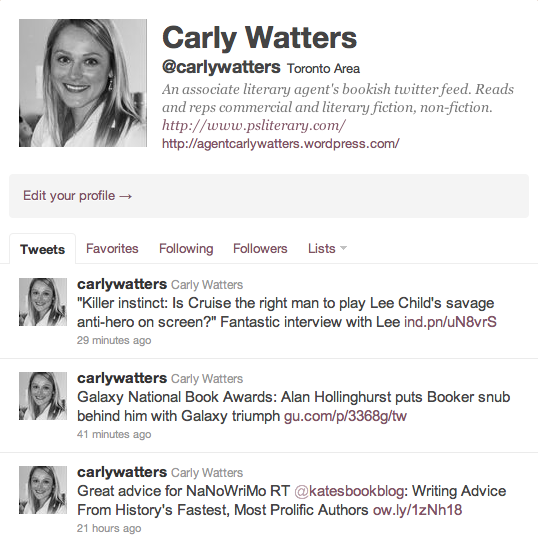 I’ve had a Twitter account since early 2010, an agent blog that gets 1,000 hits a month and we’ve recently redone our website to reflect our dedication to consistent agency and author brands. We’ve recently begun to explore the option of a freelance publicist, communications intern, and are always open to ideas from our authors on how to better support them in these changing times. Our clients have done ebook first then print book arrangements as well as follow traditional publication models. We aren’t going to open a digital publishing arm as there are digital publishers that already do this so well. We will continue to do what we do best: licence rights (whether print or digital), support our authors’ careers and offer guidance, negotiate contracts to best reflect the changing interest of publishers and authors, on behalf of our authors. For my great tips on social media see this post from earlier in the year. Follow me on Twitter here. I’m a teacher writer/teacher who has left the classroom for awhile to try to get some “real” writing done. I’ve started a blog and have found it to be quite time-consuming, so much so that the ebook I hope to self-publish gets put on the backburner. Sites like yours are very helpful.